Cooper is one of the most well-known brands of car tires. People love Cooper tires because of the high quality, durability, as well as relatively affordable prices. 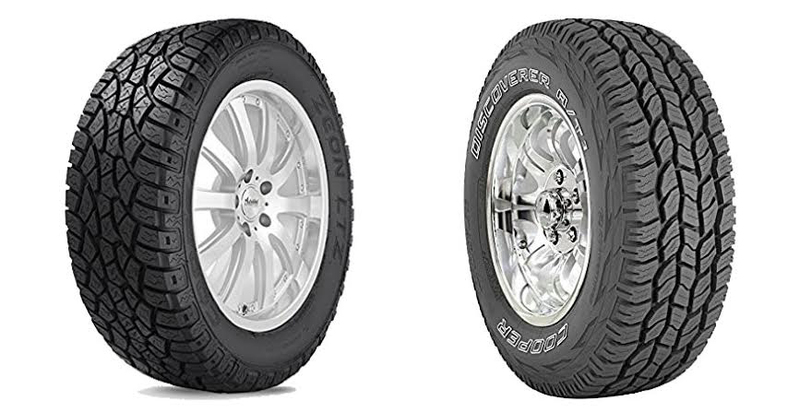 Now, for an all-season and all-terrain tire, you are most probably considering both Cooper Zeon LTZ and Cooper AT3 at the moment. Both are popular models with excellent reviews. You can consider them to be in a similar price range, though Cooper Zeon LTZ is usually a little bit pricier than Cooper AT3. So, should you go with Cooper Zeon LTZ or Cooper AT3? Let’s see the comparison! Cooper Zeon LTZ is said to be one of the best all-season and all-terrain available in its price range. It features alternately scalloped shoulder lugs that provide enhanced traction on soft and slippery surfaces like sand and mud. Furthermore, it also has the long “Two Z” element siping that greatly enhance the traction in any weather, at the same time balancing the tread element stiffness for reduced tread wear and improved handling. The lug tie-in zones possess raised and serrated lug locks between tread block elements, functioning to reinforce the tread pattern for better traction, steering, and durability. On the other hand, Cooper AT3 comes with the modern and aggressive five-rib all-terrain design for outstanding performance in both on-road and off-road applications. The silica-based tread compound delivers superb wet traction and handling, at the same time creating high resistance against cut and chip for use on a harsh rocky or gravel terrain. It has a broken center rib that improves traction on soft surfaces without reducing handling, and dual draft tread element walls to further reduce stone retention and stone drilling. Cooper Zeon LTZ proves to be superior in any weather and any season on the road. The unique pattern design really improves the handling, even in rain and snow. Cooper Zeon LTZ can also perform well for mild off-roading. However, if you are going for heavy off-road use, then you need to choose Cooper AT3 instead. The heavy-duty construction provides better ruggedness and resistance against harsh terrains. The handling is also very good. Cooper AT3 can last longer for such heavy-duty use. Plus, it is also cheaper, which means that it is more cost-efficient for the long run. - Broken center rib improves soft surface traction without sacrificing handling. - Silica based tread compound provides excellent wet traction and handling on the highway. - Dual draft tread element walls aid in reducing stone retention, stone drilling and assist in cut and chip resistance. If you only drive on-road, then you can choose Cooper Zeon LTZ, which has superb performance in any weather and season. However, for off-road use, then you should lean to Cooper AT3 instead, which is more rugged for harsh, challenging terrains.